FOM Friday: ‘KnowledgeWorks’ or Knowledge Quirks? This arm of the CCSSO has been around since 2005. It’s the educational vision caster for the Council. From what I read, it should qualify for science fiction, that is, if all of this education reform were a joke. KW fully supports personalized learning. So what is ‘personalized learning’ via CCSS? Well, according to the West Ed(a separate CCSS entity) presentation featuring two Personalized Learning experts, It’s a 3 prong answer. a) Differentiation (lessons tailored to meet the students needs); b) Individualization (learning needs paced to different learners); c) Personalization (a combination of both). They went on to share that UDL (Universal Design for Learning) works well with CCSS because by profiling the students to find their needs (differentiation in action), redesigned the classrooms to fit everyone (individualization in 3D), the Common Core flows, blends, and moves with ease. All this is done in an effort to ban failure of any kind, because via the CCSS Machine, ‘failure in not an option’. There are literally hundreds of examples of similar experiences. They all share one thing about us as humans, if we DON’T fail, we cannot learn all there is to learn. As we know, CCSS loves rigidity, so naturally, ANYTHING promoting flexibility must be stopped! Therefore, “Total Fallacy” prevails. More of KW’s vision? State leaders must set parameters for ALL students knowledge, skills, and dispositions for career/college, citizenship, and lifelong learning. States must set into motion competency based, personal learning that can happen anywhere and at anytime. Before I share with you some more, let’s rate this overall, “Total Fallacy”. Why? Several reasons, the biggest one is which state leaders? I, personally do not think every state leader should set parameters for ALL students. It’s almost impossible to combine a CCSS aligned version of ‘personalized learning’ in such a broad context. This statement is better suited as a paradox, not a solution! If we break this down further, what context is “ALL students” used in? According to CCSS, it only impacts certain students. “Certain” and “ALL” are not the same and the fact the KW purposefully chose all capitalized letters for ‘all’ leads me to wonder. 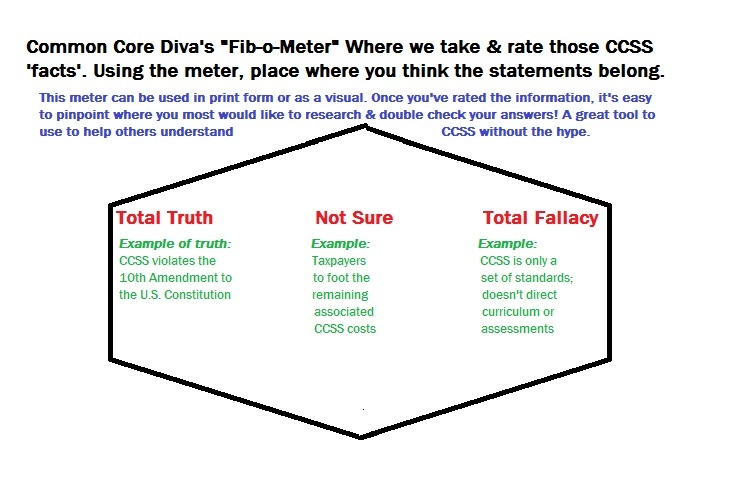 However, even the Fib-o-Meter knows the CCSS statement that ‘it only impacts certain students’ is “Total Fallacy”, too much has been documented, reported, and shared that will many times over disprove this CCSS claim! CCSS impacts all students in one way or another!! Oh, what was I going to share? If you type in the key words to the above statement, you’ll get an almost verbatim result from other well known CCSS supporters, like ‘Achieve, Inc’. CCSSO also has the following groups under its authority. NewTech Network, EDWorks, and STRIVE Together. Each of these groups has specific missions which encompass the basic principles set out in KW’s vision. They each come at it from different angles. Making sure Common Core is further implemented. Don’t conquer and divide what you can surround and suppress. Helping them along are partners like, iNACOL (the International Association for K-12 Online Learning), their mission? All students have a world class education via blended learning for a lifetime of success. iNACOL is managed by MetisNet (a group which works with non profits, as well as other kinds to promote the ‘greater good’ and help change society) as featured in the recent report published by iNACOL in conjunction with ‘Competency Works’. The report also involved Achieve, Inc., Great Schools, Matchbook Learning, NH Dept. of Ed, IA Dept. of Ed., Clay Christensen Institute for Disruptive Innovation, the National Center for Learning Disabilities, Jobs for the Future, EdTrust, and the Nellie Mae Foundation. The report?? It details the Federal Framework for K-12 Education Policy (the official title: “Worthen, M. and Pace, L. A K-12 Federal Policy Framework for Competency Education: Building Capacity for Systems Change.”) The report is full of the same tired lines about outcome based education, ditching as much old (traditional) models and revamping everything. Did you catch the biggest ‘Total Fallacy‘? Here’s a hint, federal. (Fib-o-Meter’s going ‘totally fallacy’ crazy on this concept) Here’s where you can get your copy of the report mentioned above. EDWorks, part of the greater CCSSO body, is all about fast tracking high school and college for students. After all, everyday is a great day to get college and career ready..especially when you align your learning to CCSS and buy in to the already run through the Fib-o-Meter fallacy of ‘college/career readiness’ (you can find that post in an earlier Fib-o-Meter Friday) EdWorks also uses ‘Career Pathways’ (CCSS aligned) and ‘STEM’ (the greater agenda item using CCSS as a means to an end). StriveTogether has established a continuum of quality benchmarks called the Theory of Action for building and sustaining civic infrastructure. Across the continuum, there are four fundamental “Gateways” which signal your partnership’s progression towards becoming a Proof Point. By crossing through each Gateway, there is a greater likelihood for sustained impact and improvement over time.” Be sure to click on the picture to enlarge it. While what’s begun is “Total Truth” remember it’s based on “Total Fallacy”, so the Fib-o-Meter’s going to balance out and end up in the ‘neutral’ position. My advice, we need to delve into these branches of CCSSO a bit more. As far that 90 city “Cradle to Career” network, the closest city to me that’s a member is Winston-Salem, NC under the name “The Forsyth Promise”. 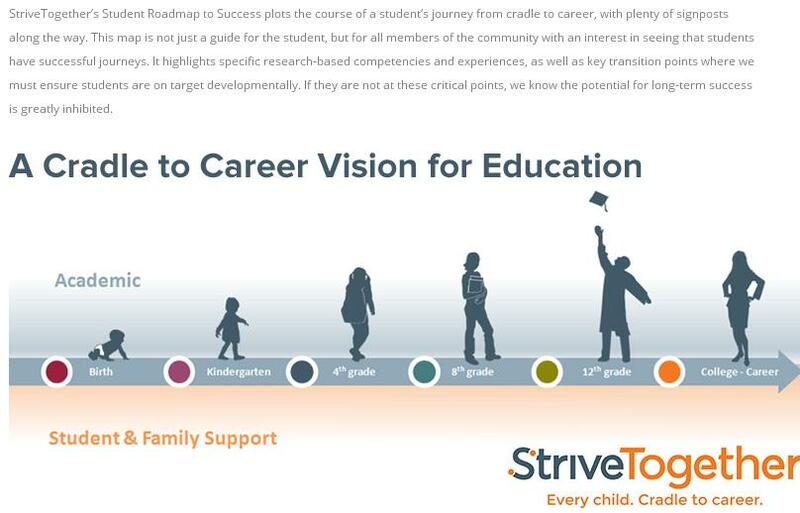 To see if a city near you is already begun this alignment, http://www.strivetogether.org/cradle-career-network. This arm, is non profit, transforms schools digitally and is big on PBL (Project Based Learning), all of course set for rigor! (http://www.newtechnetwork.org/) How much are they behind the CCSS? “The broad acceptance of Common Core State Standards (CCSS) as de facto national standards in literacy and math.” Read more about their alliance, http://www.newtechnetwork.org/sites/default/files/resources/ntnccssccready.pdf The Network is also into STEM, embedding data and more! As far as the Fib-o-Meter’s take on the ‘de facto’ reference?? This is the closest comment that’s almost rendered the Meter off the scale! “Total Fallacy”!! Education in America was never supposed to be ‘de facto’ anything! Our Founding Fathers, our U.S. Constitution, our Declaration of Independence painstakingly laid out a system of freedom. Lots of interesting history in this article and understanding common core and how it came about and how governors and the feds are running everything when it comes to education. This is a MUST READ!!!! Knowledge Works has deep ccss roots. RichardcRiley (former Clinton Ed secretary) is involved. 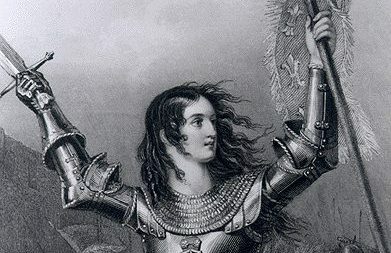 You may enjoy the blog http://www.invisibleserfscollar.com. offering a deep dive on some of these same areas.